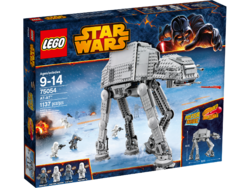 75054 AT-AT is a Star Wars themed set released in 2014. This is a description taken from LEGO.com. Please do not modify it. (visit this item's product page) Evade the mighty, stomping legs of the AT-AT™! This is the fourth version AT-AT. This page was last edited on 14 August 2016, at 02:33.